Normally it is a cardinal rule for Wegner’s chairs that they are functional, which first and foremost means they must be good to sit on. However. There is an exception to this rule. 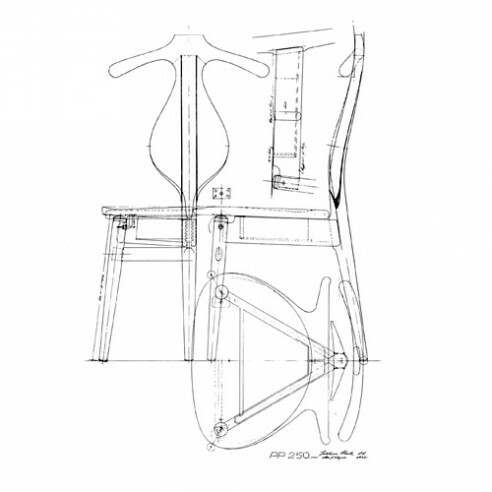 PP250, or the Valet Chair. (Its Danish name is ‘Jakkens Hvile’, which in direct translation means ‘The jacket’s Rest’.) Of Wegner’s more than 500 chair designs, it is probably the one that demands the most practice and determination to sit on. If you sit too close to the edge, the seat can flip up from behind and throw you to the floor, and since there are only three legs, maintaining balance while seated can also become an issue. Still, there is one mitigating circumstance in that the chair wasn’t really meant for sitting, but rather to serve as a piece of sculptural hotel furniture for the busy businessmen who probably comprised the majority of hotel guests in the 1950s. Here the guest had a piece of furniture where he could place his coat on a hanger specifically made for the purpose, when he flipped the seat up he had a place to hang his trousers (while keeping the creases sharp) and reveal a tray in which to store his small change, keys, and pocket contents. Seen in this light, the chair’s appearance suits its practical intention, yet it retains a kind of playful aura. Architect Viggo Sten Møller, who was also editor of the periodical Dansk Kunsthåndværk (Danish Arts & Crafts), had a talent for mediating and communicating. He had used this to Wegner’s advantage before, and it happened again when he christened the chair the ‘Valet Chair’. Few people can recall the model number unless necessary, but everyone can remember the chair’s name for its visual descriptiveness and touch of humour. It is a fitting name for a piece of furniture that needs a bit of explanation before being used, and one that also reflects its humorous shape. Exhibition of 1951. It was inspired by a conversation Wegner had with architect Steen Eiler Rasmussen and designer Kay Bojesen where they discussed what they did with their clothes when they took them off in the evening. The solution to this problem was a chair which had four legs and an integrated coat-hanger shape held on a pair of verticle supports. This variant was ordered by the Danish King, Frederik IX, but Wegner was not 100% satisfied with it. Judging from his many changes to the chair, he must have felt it was too heavy and not sculptural enough. On top of which he finally had the perfect chance not to think only in terms of functionality, but also express himself playfully, as his friend Kay Bojesen did when he made his small wooden figures for children. The final three-legged chair was given a far more anthropomorphic appearance. Therefore. It was natural to allow the rear legs to merge, transforming the two back supports into a single vertebral-column shape bulging on both sides like a torso. The seat came to resemble the human posterior even more, while the coat hanger continued to resemble shoulders and two small arms. This version was shown for the first time at the Cabinetmaker Guild Exhibition in 1953, when Wegner seems finally to have been satisfied. Like the Cow Horn Chair he made the year before, he chose to accentuate, rather than conceal the joints between the three sections of the ‘torso’ using narrow strips of dark wenge. As Wegner himself said: ‘In a production you can’t find two pieces of wood that always suit each other perfectly, so I’d rather accentuate the construction itself.’ A very honest approach to the chair’s construction that also gives its back a play of colours and more personality. PP Møbler took over production of the Valet Chair in 1982 when Johannes Hansen decided to stop. Wegner originally imagined the chair made out from pine with a seat of teak to provide a contrast between light wood and dark, which further accentuated the colour play of the inlaid back. While PP Møbler still sells this version, most of the chairs are made of maple and teak.